Interviewee: Felix Sánchez (President of the Naso Foundation) and King Valentín Santana (King of the Naso People). Theme: Naso struggle for land rights against the Ganadera Bocas company and the violence of the company and police. Notes: Please note that the following translations are of bit-conversations and part-conversations held whilst walking to the Naso village of San San Drui and of similar during our visit to the village. Some of them therefore start and/or end in mid-sentence. Please also bear in mind that some of the conversations are with people for whom Spanish is their second language – i.e., not just the interviewers – and especially in the case of King Valentin there is a problem of secondary translation of a secondary translation. Felix Sánchez (FS): … the lands, including marking the limit of these lands. When they delimited these lands, it was never known that if you were next to me then you have to know which is my land. From a plane, they mapped this and they marked points with GPS and drew their map and began to make their arrangements/agreements. So, with the company, the Standard Fruit Company, at that time they were the bosses, but at the same time they weren’t the owners, they were the nation’s tenants and not the legitimate owners; but afterwards, in the seventies, the company went up for sale as a business, changing its name to one which had possession of the land and a pile of rules and arrangements which they made. That’s when it all started happening. Martin Mowforth (MM): Perhaps you don’t want us to use your name? Is that OK or not? FS: No, that’s not a problem. What we have always seen, at least for my part, in our experience of documenting all this, is that it’s necessary to know who is providing the information. So I would say that in the case of the interview done when this other person came last year and published information, several things were not right. Perhaps they didn’t meet with the right people who had a full understanding of the issue. It was very superficial and left a lot of doubt and many things that were not clear. MM: In our case, our aim is that we are in the Central American countries to research a range of projects, programmes and environmental problems. In our opinion, the special difficulties faced by indigenous people, on land titling, is an environmental problem. So we are going to produce a text on these problems, and one chapter is going to cover the problems experienced by indigenous groups. Male voice: At the Central American level? MM: Yes, Central America. As you know, there are many indigenous groups in Central America. Male voice: Yes, Guatemala alone has 23. MM: We’re aware of this. But with your permission we are going to use the case of the Naso and your difficulties with the titling of your lands, and especially your conflict with the Boca Cattle Ranching company [Ganadera Bocas]. And if you wish I can send to Eliseo by email copies of what we write. Male voice: You can use my email too. The organisation has an email too. MM: We’ll send it to both of you. Male voice: I think that it’s not just a problem of land titles in indigenous territories, which is a problem throughout Mesoamerica, but it’s also one of concessions too, which is the other way of wresting indigenous territories from us. It would be good to see what happens with the new initiatives which some governments have, like in Honduras which has the PAT [not sure] which is something like PRONAT here in Panamá, and to see what are its origins, especially seeing that today there are some incoherent things going on relating to the reality of our culture. To talk of land titling in indigenous territories is totally disconnected with the reality of our culture. Here we can say that when he or she inherits land, they say: “Your land is from here. Where is your almond tree?” to give you an example, no land is titled and nobody is asking for it to be so. It’s an initiative which comes from the government. So it would be good to focus on land titling not like, say, Ganadera Bocas as one such case, but with the Naso people there are many cases within the concession of people who are losing lands. MM: I understand the problem and I want to ease your mind about the words we may use. We are very sympathetic to this case and to other cases associated with indigenous peoples. So we want to write in favour of your cause. We can send copies of what we write to you, Eliseo and others so that you can check our words. Male voice: Yes, also so that we can give it to the community. It’s a preference that we have because many people come researching, they take away their information, and the community is left without knowing of what they did with it. It’s better to talk with the community. I’d like you to meet José before the mayor arrives. The sun’s very strong. FS: That was what I was going to explain to you. That’s the government’s initiative. Here it’s called PRONAT, which is the National Land Titling Programme. In Honduras it’s PAT which is the same kind of initiative. The financiers are the World Bank and the BID [IDB, Inter-American Bank for Development] which are behind all that. In Perú it’s Law 1035, in Mexico it’s called …?? ?… ; but they’re all similar initiatives which the states are assuming will enable them to provide some form of legalising land ownership. It means that land in indigenous territories will have a greater value, but it’s a clever way of continuing to take land away from indigenous territories. What you can see here, those titles, those posters and signs, precisely those there [pointing], that’s the propaganda and part of the campaigns to make people aware of the need to get titles to their land. So, clearly, it’s not a programme which comes from the people’s initiative. It’s an initiative with its origins in the government, and also in the World Bank and the IDB which are behind these things, to be able to see the effects of the supposed valuation that they’re giving to land in the indigenous territories. We’ve had a terrible experience here in Panamá with that project that the government runs through PRONAT. It’s terrible that they’re trying to push it further. We even sent an investigation to the World Bank, we signed up to the panel of the World Bank and asked them to carry out their own investigation into the project that they have here because PRONAT exists because of World Bank funding. So recently the World Bank panel came and actually the inspection panel has the authority to conduct its own investigation, which it is actually going to do in October. FS: … here in these lands where we are. From there [pointing], where you see those posts, as I say, up to there is San San Drui and La Tigre is further down. Historically, all these lands have been inhabited and it’s proven that the burial sites were here in this place. In a given moment of history, the pressure of the ladinos who came making themselves owners of the lands, at that time they chased off the Naso from the hill. So the Naso went to the mountains which you can see beyond. Now after all that, the process of struggle has begun for the recovery of territory, of the lands lost. Now the conflict that has begun is different. At least if the population from here had had the same knowledge then, about what they did here … , they wouldn’t just have fled towards the mountains but would have gone beyond the other sierra too. But now there is a greater knowledge that there are legal procedures and there’s an internal process of struggle too, of resistance; so the situation is completely different. Here, where we’ve just arrived, is precisely where the community has marked the boundary with the Ganadera Bocas company. From that fence over there is Ganadera Bocas land, but within that, where we are, lands are titled to Ganadera Bocas including all of the community higher up, the schools, health centre, everything that’s above that. It includes all that’s there. MM: We are here to research about environmental issues and we have heard and read a lot about the Naso’s problems. For us, these problems are environmental problems. Is it OK to ask some questions? Quito Torres (QT): [translation] He says that’s OK, everything is perfectly fine, no problem. As the authority he thanks you for your efforts to get here. So he is happy to say something if it’s possible that it may interest you in trying to get to know the problems that we have here and that we have had for a long time, he says. For him it is good that you are getting this knowledge from a long distance away. So, from everyone here, he makes it clear that he must facilitate this interview. MM: Thank you. So we could start with the most urgent and most immediate problem which is the problem of the destruction of your houses and community centre by the police, following the directions of the Ganadera Bocas company. Could you tell me a little bit about this problem and the current situation? (QT): [translation] He says that in times gone by, our parents and grandparents lived here. And by chance for what is happening right now, there are white people who have been exceeding or overstepping our limits, our boundaries. So as is our custom, we keep defending our territory and we call on many people who come to know the problem that we have here that it is the white man who is stealing the land, and the land is ours. MM: Do you expect other assaults as before when your houses were destroyed? FS: Yes, they’ll do it again. So that’s why the mayor has come today, to talk with the community. He wants to inform them because the central government is already exerting pressure. The local communities are totally convinced that the lands are theirs, and therefore they [figures in authority] would prefer to come and talk with them and to suggest that they have authorisation from the central government for …?? ?… So, we wait, although the mayor has said, “I’m not going to send any uniformed personnel”. You’re going to hear him right now. He never wanted to see any uniformed people in this community, demolishing, making them homeless, for nothing. He has said that he’s not going to do that. MM: One related question. Have the people whose houses were destroyed got other houses now? Have they moved to other communities or other places? FS: Those are the little ranchos that we see right now. They began to construct little ranchos which are not really permanent. There are some which are in places loaned by their relatives, some others higher up, but the majority are there [signifying the centre of the village from which we’d just come] making new ranchos; and so of course they talk of other displacements. MM: As far as other problems that the Naso have, for example, the Bonik dam, can you tell us something about the current situation with this project and your struggle against it? (QT): [translation] He says that he is not fighting for just one sector/part, he’s fighting for the whole territory. He is defending this territory; this territory is completely ours. So he’s done enough. There is one type who calls himself Tito Santana. He has betrayed his people in this case; and the government has also begun to pay him some attention. The King says that he is going to defend his territory, and he is going to keep it. He makes a call to all white men, to the President of the Republic, to whom he has personally said that he is defending it. The President never took notice of him, yet the President of the Republic betrayed these people and so the problem is carrying on the same now as before; and people threaten them. So, he says that it doesn’t matter, it doesn’t matter, if you see yourself going to the end, to the edge of a group, to the edge of everything that we have, mainly in our area, which is called the Naso territory, the struggle is to keep yourself going as always, regardless of what happens. To him it doesn’t matter to say to your people that they put themselves in a corner in their area, in a place where there are no houses; we are defending one single cause which is our struggle, that is our right to our territory. He says many thanks to you for coming here as journalists, not part of this country, as part of other countries, prepared to get to know us, because friends from other countries have helped us a lot when they have got to know our case. He hopes that we can continue to trust you so that tomorrow will bring us a good reply to this government plan to violate us. MM: As Felix has already said, could we get the details, the reports, from you? FS: I think so. In the case of the King, what we have often seen when he has acted – in the same struggles against the dam and against the company – is that he has served as the focal point, at least when the police invaded the community, when they arrested people, at the moment when he arrived on site they didn’t detain anybody. We can show lots of photographs where it is the King, surrounded by police, who is talking to them, intervening for the community. So it’s a case that he has shown himself. Within the whole process of struggle, he has always demonstrated the bravery to go and confront the power of government. They have lost a lot because on many occasions when he was present they couldn’t arrest anyone, but when the community was on its own they took people away as prisoners. On the one hand, that is one of the things he has been doing. On the other hand, he has also been at the forefront of the process of our making claims and demands. In the legal processes which we have been pursuing he is the signatory. The King has been the focal point in all of this, but as far as the other one is concerned there is a king who the government bought, and the community sacked him. Although he’s been removed from office and separated from the people, he doesn’t live in the territory, but even so up till now the government recognises him because he represents their interests, he liaises with them, he signs agreements, they do loads of terrible things through him. That’s been happening here. You can see in various writings/articles that King Valentin is described as a defender of the environment. On the other hand, we’ve dealt with all cases in a technical way, but we have always looked for decisions to be clearly associated with the King’s authority and with the community’s too. … We could show you in documents how the last government left everything more or less in favour of the company. We have always kept up the struggle without doubling our efforts and without getting too excited or duplicating efforts. 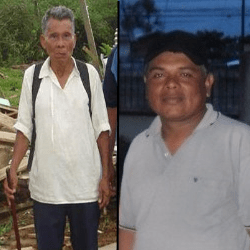 Those are the two very similar processes – the Ganadera Bocas company and the … company. FS: … what we call here basic education, but also goes on after sixth grade – here they’re building the college. It serves the community. As you can see here, physically the new land area doesn’t allow it, but there’s going to be a problem of crowding, of expansion in the future, because the land is small and limited. To expand a bit more this infrastructure is important for the community. Right now, it’s very limited for the children, and that’s what’s needed here, at least to have good park area. Good land to build this infrastructure is important. That’s what we’re thinking of for the future. But here, as you can see, there is no future, it’s so restricted. And that is what the fight is all about – Ganadera Bocas on the one hand throws people out and into the mountains, but imagine the infrastructure required in the middle of this natural area of sierras; look at the slopes that we have to deal with. When they defined the property title they included all these lands, all that is here … The community became owners of this. FS: The political structure of the Naso is composed of the traditional figurehead who represents us: the King. Following that is what we know as the Council of Leaders of the Naso People. This council is made up of leaders of each community, and our territory includes 11 communities. These leaders are those who discuss issues; it’s like the assembly where laws are discussed, and issues of development are approved and disapproved. Then there’s another organisation which is the General Assembly and that is the body which gives the final approval or disapproval of what is discussed in the Council. The King is the figurehead, completely traditional. He represents us and is the image of authority as King. But he is above everything and coordinates the political structures that we have, namely, the leadership [the Council] and the Assembly.